Alexander Hume Ford : A Boy's Paradise in the Pacific, 1908. Ford, Alexander Hume: A Boy's Paradise in the Pacific. 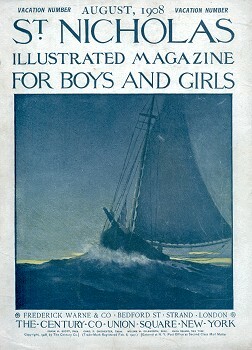 Ilustrated Magazine for Boys and Girls. Volume XXXV - III, Vaction Number, August 1908, pages 876 to 881. In August 1908, Ford had his second surfriding article published, this time by the mainland press, in St. Nicholas magazine. 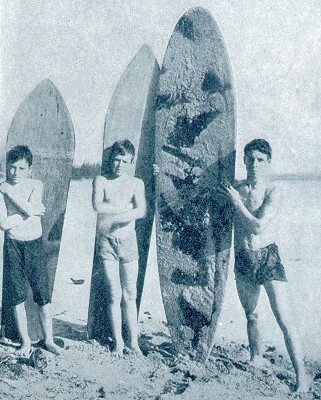 Titled "A Boys' Paradise in the Pacific" it was specially tailored for the magazine's family readership and was primarily focused on surf board riding, with some comments on body and canoe surfing. Ford notes surfing is practised by both genders, has a regal heritage, and has been successfully adopted by "white" residents. The other major racial groups in Hawai'i; the Japanese, Chinese and Portuguese; are, according to Ford, either less proficient or had little interest in surfing. While the relative canoe surfing skills of the whites and natives are debatable, Ford concedes that the native helmsman is superior when "there are large waves to encounter." 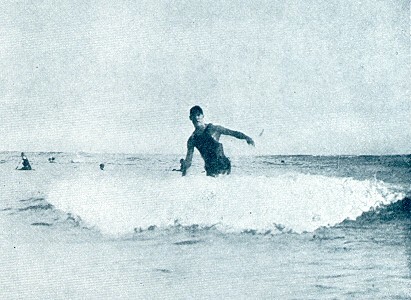 Whereas, Jack London reported in 1907 that Ford had accomplished standing surfing in a matter of weeks and without the benefits of instruction, here Ford recalls that he "learned the from the small boys of Waikiki" and that it took "four hours a day to the sport for nearly three months." Body surfing is, for Ford, a "difficult feat, and one which I succeeded in accomplishing but once." 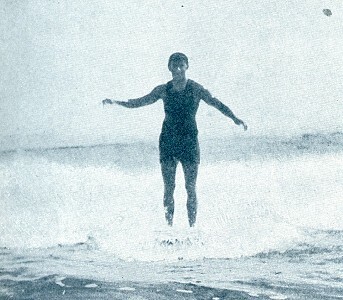 The majority of the accompanying photographs, some presumably by the author, are of surfing and one, "Coasting Down a Wave," was previoulsy printed by the Hawaiian Gazette in June 1907, where it was titled "George Freeth" with copyright by Alexander H. Ford. It is of superior quality compared to the earlier newspaper reproduction. Also discussed and illustrated are a variey of juvenile pastimes such as mountain climbing, sliding on ti leaves,"foot-diving," horse riding ("Paa-u races"), raising ducks, swimming, flume riding, and diving for coins. Ford, Alexander Hume: Riding the Surf in Hawaii. Bridgers constructed a timber surfboard, and probably several, or oversaw their construction, based on the designs (approximately 7ft x 18'') illustrated in the muli-board portrait at Waikiki, published in 1909. 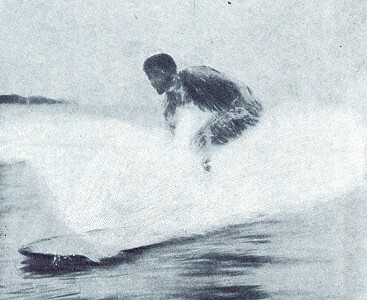 The boards were tested at Wrightsville Beach, North Carolina, by Bridgers and several unnamed "surfers" who attempted to ride standing, as shown in the Collier's article. This was only achieved by "small boys under 100 pounds." 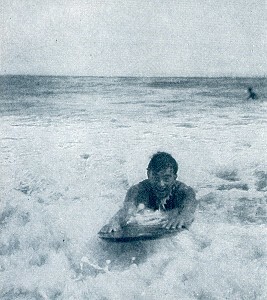 This summer of, largely unsuccessful, experimentation lead Bridgers to write to Ford, care of the magazine, for further information on board construction, riding technique, and suitable surfing conditions, which was subsequently forwarded to the press in Honolulu. Honolulu, Edition April 7, 1910, Sports, page 5. - Noted by Joseph "Skipper" Funderburg, posted in the Surfblurb, March 2014. Page 876 A Boy's Paradise in the Pacific. HAWAII is the land of sports for boys and girls. Approach Honolulu by steamer, and at first sight of the breakers on the reef the eye is arrested by little specks upon the waves that, examined through the glasses, prove to be small boys, black and white, standing erect upon the foaming crests - the surf-riders. 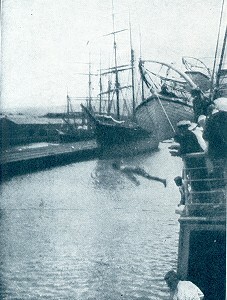 At the dock are a score or more brown-skinned lads ready to dive for dimes and nickels which the passengers are invited to throw overboard. On the wharf are women and girls with leis (wreaths) of brilliant flowers to throw about the necks of those who land, and the young girls a-horseback in those long, gorgeous, flowing robes are the Paa-u-riders, for Paa-u- riding is the girls' sport in Hawaii, as diving and surf-riding are the special delight of the boys, although some of the little native girls are as skilful at these aquatic sports as were their mothers before them,- when they were girls. Fishing, of course, is a sport in which everyone, old or young, indulges in Hawaii, our island territory. Even the small dogs are taught by the native boys alld girls to burrow for the crabs in the mud at low tide. In fact, the chief sports of the boys and girls in Hawaii today are those that have descended to them from the old Hawaiians, who have long since abandoned play for work. Surf-board-riding was once the pride of the chiefs, and to this day only native Hawaiians can infallibly steer an outrigger canoe through the raging surf. 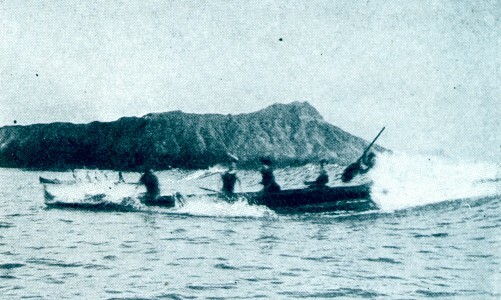 although the small white boys of Honolulu are sometimes successful in the smaller canoes and in comparatively calm weather. Then there were the famous mountain slides down which the most athletic of the Hawaiian braves used to hurl themselves. This sport survives to-day only on the hillsides where the white boys use ti leaves in place of the ancient native land-sleds. Foot-diving from great heights is still a pastime of living Hawaiian princes. LEARNING TO KEEP THE PLANK IN FRONT OF THE WAVE. HAWAIIAN BOYS AND THEIR SURF-BOARDS. ... ing to watch the native try his remarkable aquatic leap, foot foremost, while he plunges into the water, head first. The white lad has taught the native boy to play base-ball, and the native has taught his fair-skinned American cousin all the sports of his forefathers. In Hawaii the Japanese children out number the whites and natives combined; the Chinese children are as numerous, and the Portuguese, who are in a class by themselves, more than equal the number of American-born children in Hawaii; yet it is the white children only who have successfully mastered the Hawaiian sports. I was more than amused when learning to ride the surf- board to notice that the Japanese seemed never able to acquire the difficult knack, while the small white boy very quickly became, more adept than the native himself. Most of the surf-board-riding on the island of Oahu is done at Waikiki Beach, just outside of Honolulu. Here the small boy keeps his surf- board, and even little girls and young ladies sometimes try to learn the secret of keeping the little plank going before the wave. I will tell you the secrets of the art as I learned the from the small boys of Waikiki. First get a two-inch plank six or seven feet long by about a foot or even sixteen inches wide. Point one end and smooth the edges all round and you have a surf-board. Next you must learn to send her shooting through the water. This requires developing certain muscles. For first you lie flat on the board on the water, learn to balance yourself, then send your arms flying around like a pair of windmills. At first you will grow very weary and your ribs at the chest where they rest on the board will pain you, but persevere and in a few days you will begin to acquire the necessary stroke and learn to balance yourself. KEEPING JUST BEHIND THE BREAKER. NATIVE HAWAIIAN BOY ON HIS SURF-BOARD. ... will be able to send your board speeding through the water. Start out for the great long rollers beyond the breakers. As the waves roll over you, duck the bow of your board and cut through. Once out where the rollers begin to form, be on your board until one comes with a feathered edge, usualy the third in a series. Just before it reaches you, paddle with aIl speed as if to escape it; if you have judged the right moment and are speeding your board fast enough, the oncoming biIlow wiIl carry you before it, and on that great sloping waIl of water you keep sliding down and down never reaching the bottom of the briny hiIl. Then the wave breaks and before it you go flying with the speed of a cannon ball toward the sandy beach; throw your legs to the right if you wish to turn to the right, and to the left if in the other direction. Keep your arms out rigid, clasped to the bow of your board if lying down, or if you wish to rise to your feet, do so in the flash of a second and then balance yourself. That is all there is to riding a surf-board, but, oh, what long and tedious, trying it takes to put these simple rules into successful practice. I am certain that I gave four hours a day to the sport for nearly three months, before I could ride standing, either upon the crest of the wave or before it, but my advice to every small boy who has the opportunity, is: Learn to ride a surf board. It is the king of sports. 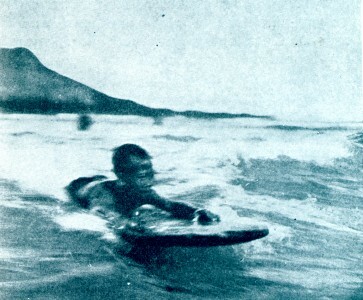 The small boy at Waikiki does not stop at surf- boarding; he delights, when the waves are high, to startle newcomers, by giving exhibitions of body surfing, that is, he uses his body as a surf-board and comes in with a wave, only his head appearing through the wall of water. It is a difficult feat, and one which I succeeded in accomplishing but once, and then by accident. My board, almost caught before a wave, sank back and lifted to the crest, and remained there despite all my efforts to thump her down to the hollow below. Suddenly the rushing waters about me lifted me bodily from my board and hurled me forward through the air to the briny valley. I thought only of the light board that in front, freed from my weight, I feared would leap up into the air and dive down, perhaps on my head. My arms became rigid and half raised before me, while my head went down. I struck the smooth water, slid upon its surface, felt my feet raised on the hill of water behind me, then a mad rush of foam about me, like a man shot from a catapult. I kept going, how far I know not, but it was a long, long swim back to my board. Yet body surfing seemed simplicity itself when indulged in by the Waikiki small boys who spend half their life in the water, and swim like fishes. STEERING A HAWAIIAN OUTRIGGER CANOE THROUGH THE SURF. The native boy of Hawaii takes to the outrigger canoe; not that his light-skined compatriots do not also go in for this thrilling sport, but when there are large waves to encounter, it is usually a native boy who holds the paddle that guides and keeps the craft from turning broadside to the wave and swamping. Surf-boarding is a bathing-suit pastime, for the sport ends in a swim. Four or five boys is the usual load for a small outrigger; patiently the crew waits, half a mile from shore, for a great roller, then as it comes rolling in, the shouting and paddling become fast and furious. If sufficient speed is attained the boat tilts up on the approaching billow and speeds downhill like the wind. Nothing can now stop her, unless the arm of the steersman fails him, and then the outrigger swings round to the wave, and if this happens as she is breaking, there is an upset and a confusion of wildly-waving arms and legs in the water. It takes considerable skill, and judgment, too, sometimes, to prevent the narrow little bark from swamping; when the wave breaks, if it is a big one, it is necessary for everyone to rush forward to the bow of the canoe, and as the wave begins to die out, work back again, and by a pumping motion work the boat so that she will catch the smaller waves near shore that will carry her up to the beach, and strand her there. It is the native who acts as steersman in the outrigger, but it is usually the white lad who ventures out in the surf in a light canvas canoe, and the skill with which even tiny youngsters at Waikiki can keep these before the waves, is remarkable; in fact, it is only equaled by the remarkable facility with which the little paddler sometimes leaps from his bark when a wave that is too big for him begins to roll his boat over and over toward the shallows. COASTING ON TI LEAVES, INSTEAD OF SLEDS. ... waters, the native boy of color, or the white boy born on the islands and within sound of the sea. Water sports are by no means the only vigorous athletics indulged in by the boys of Hawaii. Mountain climbing is a favorite pastime, for there are peaks four thousand feet high within easy walking distance of any part of Honolulu, and on the island of Hawaii there are two mountains fully fourteen thousand feet in height. Sometimes the Honolulu schools give picnics on the mountain sides that the pupils may gather land-shells. It is on these excursions in search of land-shells that the Hawaiian school-boys revel in the once national sport-mountain-sliding. A very steep mountain side is selected, where the grass, is long and sloping downward. Every one gathers his own ti leaves- the ti leaf is something like the banana leaf but not nearly so long. With a bunch of ti leaves in his hand the first boy steps to the edge of the slide, grasps the leaves by the stems in both hands, places the leafy part under him and sits down, gives himself a start and drops down the edge of the scenery like a flash. I was assured that it was an easy matter to regulate the speed of descent, by merely grasping the ti steins firmly and lifting them upward, this acting as a brake. I longed for the thrill of dropping down over the edge of a mountain, and upon my brief sled of ti leaves began the descent. A LITTLE HAWAIIAN CADDY. PAA-U RIDERS. AT THE GRAVE OF CAPTAIN COOK, THE FAMOUS VOYAGER. AND THE DISCOVERER OF THE HAWAIIAN ISLANDS. ... pieces among the trees below. I thought of my brake and drew up on the ti leaves with all my might and came up with a jerk that jarred every bone in my body. There I sat looking downward almost perpendicularly, held in position only by a few ti leaves resting on the smooth slippery grass, but the sliding grass is nearly a foot long, and it is only after it has been repeatedly slidden over and beaten down that it approaches perfection in the eyes of the Hawaiian small boy, and sometimes leads to accidents, when, for instance, the thin layer of ti leaves wears out beneath the slide, a gentle tug at the stalks parts the sled and sends the slider whizzing downward in a most uncomfortable and ungraceful manner, all arms and legs. Lucky is the victim of such an accident if he is not stopped in his downward career by the trunk of a tree. When it comes to golfing, the most popular caddy in all Hawaii is a little native miss of ten, who understands the game as thoroughly as does any boy. Then, too, the Hawaiian girl has one sport all to herself- Paa-u-riding. There are special Paa-u races on May-day, the Fourth of July, and Kamehameha Day (the great Hawaiian holiday in honor of the monarch who conquered and ruled all the islands). Even the ex-queen attends the Paa-u races, when young girls and women, robed in long flowing bloomers of gorgeous and varied color, ride by her steed at breakneck speed, yards of gay calico flying behind them in the breeze. It is not surprising that sometimes the horses bolt, and then Paa-u-riding becomes fully as thrilling as the steepest mountain-sliding. Raising ducks might be a pleasure and occupation for boys anywhere; but in Hawaii it is the chief delight of the Chinese small boy, and he has spread the contagion to his lighter-skinned cousin. Near Honolulu thousands of ducks are raised, the irrigation canals between the rows of banana trees serving as duck-ponds. The small boy delights, not only in raising ducks, but in hatching them. He buries the eggs in soft mud that soon hardens, and leaves them out for the sun to do the rest: and it does. Verily the youngster in Hawaii is never at a loss for occupation and amusement. After all, on an island, water sports must be expected to take first place. It is not surprising, therefore, that many houses in Honolulu contain swimming-pool annexes, where the children of the family delight in holding revels ,with their young friends. ... the bath- then the next day the pool or bath- house is turned over to the boys. You can tell the boys' day from afar by the noise and splashing. The Japanese have introduced at least one sport to the notice of the Hawaiian small boy. Jiu-jitsu and Japanese wrestling have not, so far, appealed to the small boy of Hawaii, but when on the sugar plantations, the sons of the planters saw the Japanese laborers riding home from their day's work seated upon bundles of cane leaves floating in the flumes, their ambitions were fired. Discarding the cane leaves they lie at full length in the flumes and go speeding along for miles. 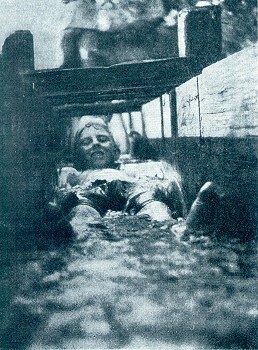 The very small boys are apt to confine their efforts to the box flumes, but there are many who enjoy the thrill of floating down a flume that crosses trestles between hills and mountains, hundreds of feet above the valley below. They even look over the edge, and wonder why the Japs prefer to sit upon bundles of cane leaves; but- as it sometimes happens a piece of broken stone, or other obstacle, finds its way into a flume there is the risk of an accident, and so the Jap method of flume riding is coming more and more into vogue. As aquatic sports are the first we become acquainted with upon approaching the Hawaiian Islands, so they are the last. From the bridge of the mail steamer as she departs- if the captain is obliging- small brown boys leap down to the waters far below, every time a coin is thrown overboard, and invariably they catch the bit of metal. A jump of fifty or sixty feet is nothing to these native Hawaiian boys, for they live in a land of sports, and are still fired by the tales of their fathers, who sometimes to this day will plunge from a steamer's deck, knife in hand, to fight a monster shark in his own element. While the boys are diving, young girls are hiding the departing guests behind leis of flowers, and singing'" Aloha,-'till we meet again," for no one in Hawaii will ever believe that he who has once tasted the delights and enjoyed the outdoor sports of the Paradise of the Pacific will fail to return to them; again and again. DIVING FOR DIMES AND NICKELS. IS NOTHING TO THESE HAWAIIAN BOYS." Geoff Cater (2012-2014) : Alexander Hume Ford : A Boy's Paradise in the Pacific, 1908.